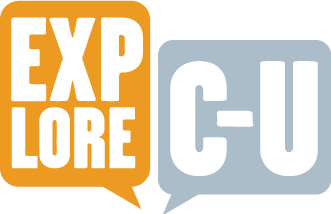 ExploreCU is a free web and mobile platform about the arts, culture, and history of Champaign-Urbana and its surrounding area. Developed by the University Library at the University of Illinois Urbana-Champaign, ExploreCU puts the people, places, and events that have shaped this region's history at your fingertips. Learn about Champaign-Urbana through layered, map-based, multimedia presentations, use social media to share stories, and experience informative tours of Champaign county. This site is powered by Omeka + Curatescape, a humanities-centered web and mobile framework available for both Android and iOS devices. Follow our progress on Twitter @ExploreCU, and email ExploreCU if you have any questions or suggestions. As this site is an ongoing project continually being updated, we ask that you are patient while we update out-of-date content. If you're interested in contributing content, please fill out this web form and someone will be in touch with you shortly. Please email any accompanying media to us with corresponding information. This project would not be possible without the support of the University of Illinois Library and the research efforts of numerous undergraduate and graduate students, community members, faculty members, and local organizations. We sincerely appreciate all that you have done to bring this project to life. The images found within ExploreCU come from a multitude of sources, foremost among them the University of Illinois Archives,the Champaign County Historical Archives, and Public Affairs at the University of Illinois. In addition, the University Archives, including the Student Life and Culture Archival Program, have generously provided invaluable research material. The Urbana Parks District and local scholar Muriel Scheinman have also provided significant research material. The ExploreCU project is built using Curatescape, a mobile framework for the Omeka archival content management system. Curatescape was created and is maintained by Cleveland State University's Center for Public History + Digital Humanities. Images and other media in the ExploreCU website and mobile apps are used with the permission of their creators, owners, or repositories. For further information about the text or media found within this site, including requests for reproductions, please contact the cited source directly. Please note that we cannot give the contact information of private individuals, nor are we empowered to grant permission for further use of any media.